I've wanted Deborah Lippmann's Across The Universe for such a long time but then I found a much cheaper dupe while reading various nail blogs. 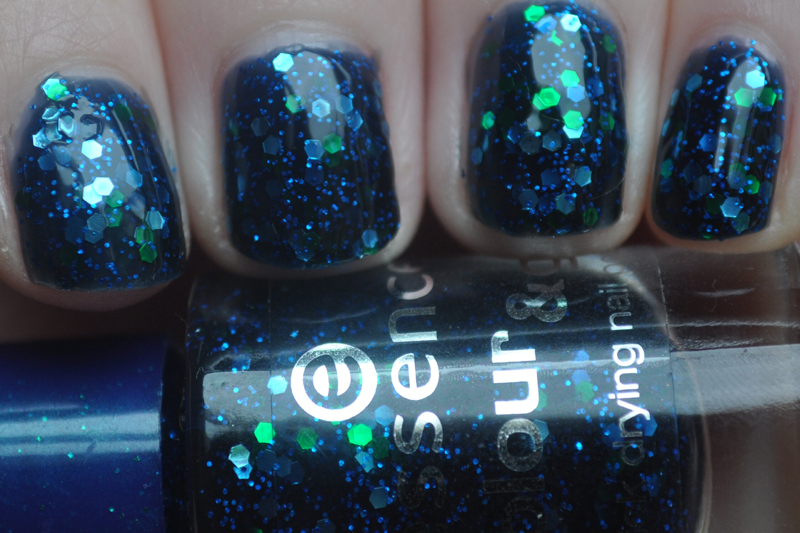 The dupe is Essence's Blue Addicted and I can't tell the difference between the two when looking at swatches. The only problem is Essence isn't readily available in the UK so I asked my mum to get it for me when she was in Croatia in May. Blue Addicted has a dark blue jelly base and is packed full of tiny blue glitter and then blue and green hexagonal glitter. For a jelly glitter polish it's actually very pigmented and I only needed two coats. I've added a topcoat, Orly Polishield as it was looking a bit dull on camera but in real life it looked fine. I've now added this to my top 10 polishes, which is probably more like top 15, and I can see myself going through this bottle so quickly. You can get them on ebay but I think I'll try and get a few more bottles when I next go to Europe or my family does as it's a lot cheaper.